Having a MyBuddy-Box has been brilliant, If there is one thing I can’t stand it is clutter. Are you like us and have a corner in your house that just tends to get piled up with unnecessary clutter? Isn’t it annoying? well I think so anyway, it is one of my pet hates. One thing I find that we do a lot of is put all the clutter into a carrier bag to try and make it look a bit more tidy. When I think about it we tend to use carrier bags quite a lot, when shopping, to store things away in the cupboard i.e hoover attachments, old rags, etc. 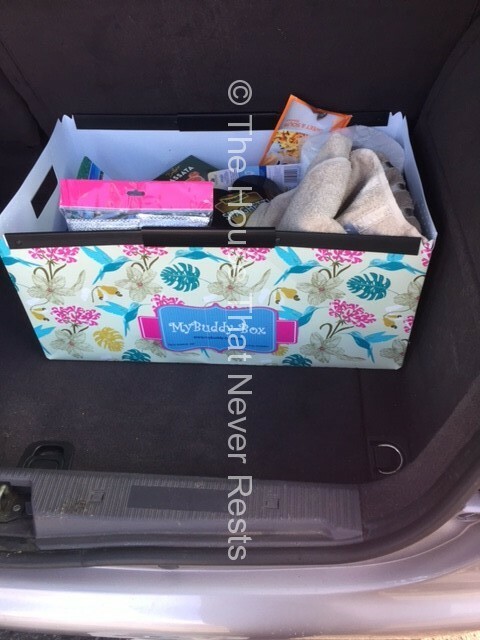 I have recently been using a feather light folding box called MyBuddy-Box, this is a reusable, foldable, stackable plastic box that can be used for so many different things. The MyBuddy-Box when not being used folds flat and looks to me like “a small briefcase”. We do have other storage boxes but what I love about MyBuddy-Box is when it is not being used it can be folded away unlike my other boxes. 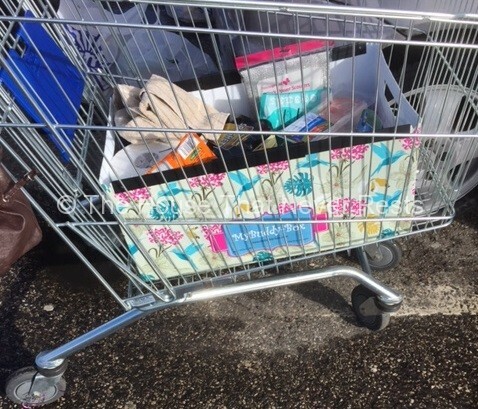 The MyBuddy-Box fitted perfectly inside my shopping trolley when I went shopping, this made packing my shopping much easier and quicker, no need to fight with shopping bags, plus there will soon be a 5p fee to pay on carrier bags from October 2015 so I need to have other measures in place for this. The MyBuddy-Box fitted perfectly inside the boot of my car. I didn’t have the worry of opening my boot and my items be everywhere. 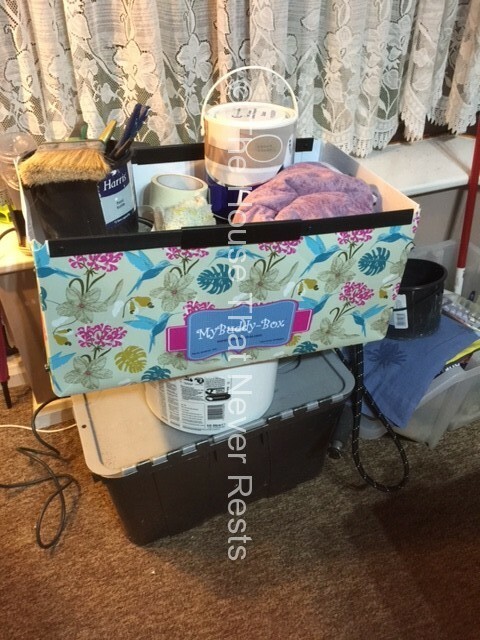 We have been using our MyBuddy-Box for storing the laundry. Even comes in handy for when doing DIY, we just packed all what we needed for the DIY job and it was very helpful to have it all to hand. 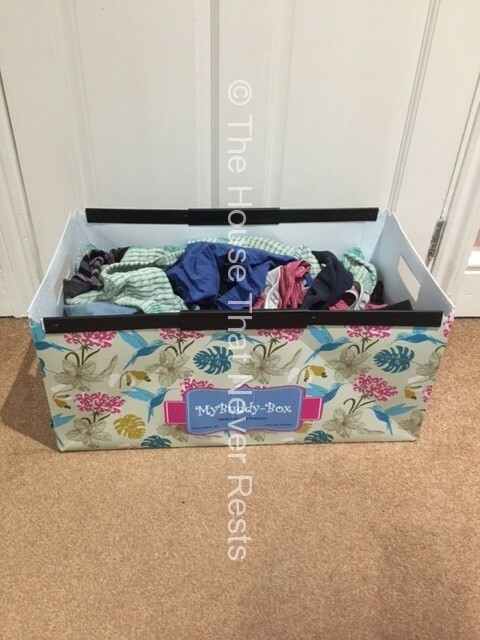 The MyBuddy-Box is a perfect solution for all storage problems, it is lightweight, opens into a very strong rigid box, when no longer needed it can be wiped clean folded and put away in a draw or cupboard until its next use! The MyBuddy-Box is made from food-safe extruded high-density polypropylene, measures 32 x 25 x 4cm when folded and weighs approximately 800gms, when open it measures 32 x 25 x 55cm very spacious and can easily hold up to 20kg! There is a choice of design’s to choose from, the box I have is the paradise design. Are you prepared for the carrier bag fee? is the MyBuddy-Box something you would like to own, if so we have kindly been given a code to use at the checkout, if you enter the code “HOUSE” at the checkout you will get free P+P. RRP£14.99. If you would like to find out more about the carrier bag fee this link should help. Disclaimer: we was sent a MyBuddy-Box for the purpose of our review. All thoughts and opinions are 100% our own. I like the look of these. I could do with one for the car, especially the back seat where Max has half the contents of his toy box! I can then just pick it up and move it to the boot or house for swapping over toys. That looks really useful but I can see my children taking it to play with! That is a really awesome concept! I like this kind of a storage, reusable and foldable at the same time. What a fab storage idea!